As the national airspace system evolves, the FAA will be utilizing many new technologies. One of the primary systems that is being implemented within the FAA’s NextGen program is ADS-B, which stands for Automatic Dependent Surveillance-Broadcast. In an effort to streamline operations, the FAA is implementing ADS-B as the primary source of navigation for all aircraft within the national airspace system. While ADS-B is already operational in most o the United States, there are still questions about the risks and costs involved. In the near future, the aviation industry will be asked to accept the idea of free flight, a method of reducing air traffic congestion through the use of ADS-B. The ADS-B system also reduces pilot and controller workload and provides more direct routing for aircraft, saving money and time across the board. 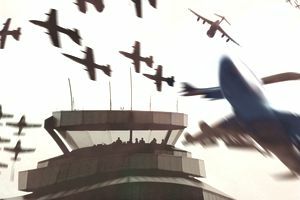 For years, the air traffic control system in the United States has suffered from inefficiencies. The system continues to see an increase in consumer demand as well as delays. The role of the ADS-B system is an extensive one. The system uses highly accurate GPS-based ground and air surveillance to provide controllers and pilots with precise, real-time data. This data, more accurate than radar itself, can be used to reduce separation between aircraft, increase safety and provide more direct routes for airplanes. In addition, real-time traffic and weather functions will be provided in the flight deck, in some cases at no cost to the operator. ADS-B uses an aircraft-based transponder (Mode S), the global navigation satellite system (GNSS), and ground stations to determine altitude, speed and track for aircraft. The information is then relayed from aircraft to aircraft and from aircraft to controller or ground station, along with any other participating parties. Overall, the ADS-B system is a major improvement for the future of our airspace system. But it’s not without risk. With the current radar system being a mostly risk-free, accurate navigational system, a move to a completely new system brings up questions of reliability, safety risks and cost. What are those questions and risks, and have they been mitigated to an acceptable level? For the most part, these risks have been researched, analyzed, mitigated and accepted. But one of the biggest hazards associated with ADS-B still remains: Human error. If the pilot doesn’t fully understand the equipment he or she is using, the system becomes a hazard instead of a benefit. Studies suggest that advanced avionics systems require in-depth training and understanding for operators to use safely, and many operators will not voluntarily receive the training they need to safely fly with ADS-B. And the FAA’s ADS-B mandate for all aircraft to be equipped with ADS-B by 2020 will intensify the costs and hazards associated with advanced avionics and human error. The Capstone project determined that excessive heads-down time while using ADS-B would potentially result in a frequent loss of situational awareness and that although an accident might be rare in this case, a resulting accident would likely be catastrophic. This is a constant risk that will continue to be a problem for ADS-B users as it becomes a familiar addition to the flying world. Pilots must accept responsibility for mitigating this risk as much as possible through training and awareness. When all is said and done, ADS-B is a safe, efficient addition to the nation's airspace system. But like any navigation aid or avionics system, it's only as safe as its operator. What's the Difference Between ADS-B Out and ADS-B In?